Water is beneficial for pretty much every part of your body, and if you’re looking to make healthier choices, NOW is the perfect time to amp up the amount of water you drink each day. Cutting out other beverages and drinking more water can improve the way you’re feeling, boost your energy and do wonders for your health. 1. Water is important to every part of our body. Our body is made up of 90% water, so it needs to be replenished daily in order to function properly. 2. Though not everyone is aware of how water actually works to make your body better, there’s no doubt that it keeps everything moving smoothly. 3. Drinking water can also help you lose weight. Some doctors say that when you think you are hungry, you may just be thirsty for some water. 4. So when you drink more water, you have less of a tendency to overeat. One trick some people use to lose weight is to drink a full glass of water before their meal, so they won’t be as hungry. 5. Water is a great detoxifier, and can clean out your body of gross toxins. For an added detox, squeeze some lemon in your water which helps purify your body. 6. Drinking water can also boost your metabolism by up to 24%. Drink ice cold water for best results, as it shocks your system into working harder. 7. Water also keeps your heart healthy by keeping your blood thin. Water prevents your blood from getting too thick. This means heart attacks will be less likely, and it keeps clots from forming. 8. Drinking water can also keep your brain sharp. A recent study showed that drinking 8 to 10 cups of water every day can increase your brain power by up to 30%. 9. Similarly, drinking water and staying hydrated can help increase your mental clarity and focus. 10. Water keeps your bones healthy, and increases bone strength by adding a protective barrier around them and strengthening cartilage. 11. Drinking lots of water can slow down the aging process, and it makes skin look young by stimulating collagen and cell reproduction. 12. Increasing your water consumption can also help people with acne, and can improve the overall look of skin. 13. Water can also decrease your risk of stroke in the same way that water can reduce your risk of a heart attack. 14. Water can also have a positive impact on your joints. It also increases flexibility and keeps the connective tissue strong. 15. Water keeps you cool and energized, and makes you feel great when you are feeling run down. 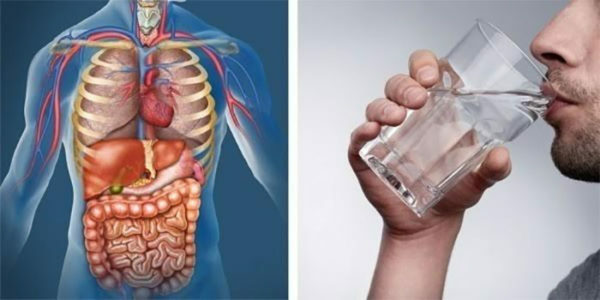 Instead of reaching for an energy drink, grab a glass of water instead! 16. With all these amazing health benefits, it’s no surprise that water helps boost your immune system. As one Slovakian Proverb says, ‘Pure water is the world’s first and foremost medicine.’ So drink up!